Star Wars Celebration is the biggest Star Wars party in the galaxy, and from August 23rd till August 26th, it will be in Orlando, Florida. Fun for the whole family, there are events tailored to the young and old. But how do you go about finding it all out? That’s why I’m here to help. I’ve got the inside scoop on everything going on for the young ones in your group. Brandon was four years old when he went to Celebration V in 2010. We arrived two hours prior to the event opening and brought snacks and some toys to keep him occupied. Once we were in the main room, he was just as excited as we were to see everything. He was a little skittish around the 501st members, but he was in love with the droids. It took him a few dozen vendors to get bored. It wasn’t until the end of our day that we finally found the kids room and he got to have some fun (and my husband and I got a break). To help out any newbies attending with their families, I decided to reach out and find out about the kid friendly scheduling. One of the activities I enjoy the most before a convention, is planning out my day. I get so excited when the schedule comes out and I finally have the chance to plan everything out. It’s also a great family activity, going through the various schedules and deciding what to hit. 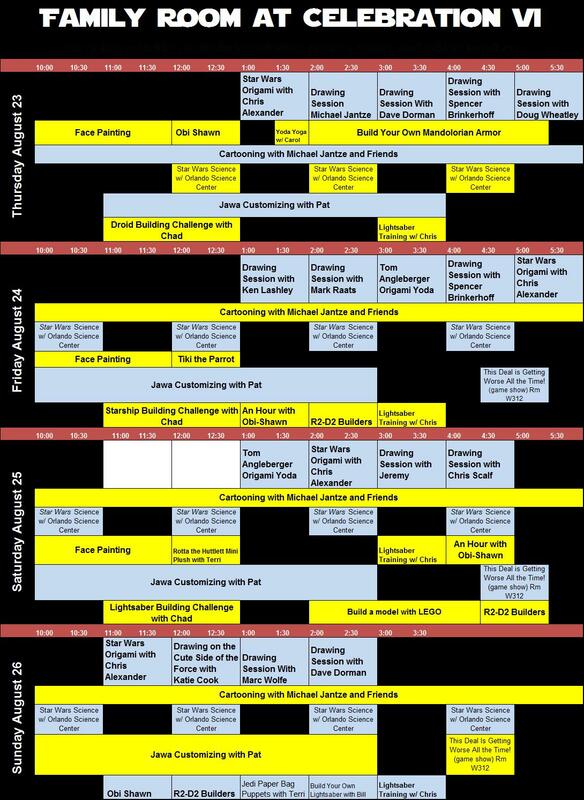 To help you along, I reached out to the individuals responsible for the Family Room and have obtained a complete schedule of events for families at Celebration VI. Print it out and let your children mark up their schedule, while you mark up your own. CVI Family Room Programming Schedule / Parents are welcomed to help and participate in all activities with their children. Chad shows the children how to make extraordinary things with everday recyclables. Pat takes existing action figures, makes a mold and creates little action figures from them. On his own, he has made a bunch of little Jawas and Gonk droids and the kids will be able to paint and customize their own little action figures. Terri has made a neat little craft where the kids will cut out little felt huttletts and stitch together a small stuffed huttlett. Due to the use of sewing needle, this activity is recommended for ages six-years old and up. The Orlando Science Center will be bring their education program to Celebration VI. Each slot is a special project or experiment for the children to have fun while learning. There is no schedule for what will be done at each time slot and some activities might be duplicated. This activity will be run by a separate group that will be coming in to help the kids make armor out of cardboard and duct tape. The kids will cut out the pattern pieces and help shape it to them and then tape it to their clothes. This should be a really fun activity for all children. Lego booth – Lego does a great job at having an interactive booth for families to enjoy. We can’t wait to see what they’ve got planned for this year. DK Publishing is another vendor that is great with the kids. On certain days they have a giveaway for the kids (while supplies last). 501st Legion Room – The 501st Legion will be hosting a shoot-a-trooper event where, for a small donation, you can shoot a 501st Legion member with a nerf gun. This year, they even have Daniel Logan, the Galactic Academy and a group of Slave Leias standing in to be shot at. Droid Builders Room – This is a great place for any fan of R2-D2. Rebel Legion Room – The bad guys can seem a little intimidating, so for the fans of the good guys, check out the Rebel Legion’s booth. It’s not to late to get your tickets! Go to Star Wars Celebration VI website to learn how to purchase the right one for you. They have several options available from single day to multi-day to family packages for you to pick from. So what are you waiting for? Go and may the force be with you! Do you have any tips for families traveling to Star Wars Celebration VI? Share them in the comments!